Submitted by kriztov on July 30, 2012 - 3:22am. It's not that we don't like you engineers, at least for me it's because a lot of the engineers I meet are pretty darn obsessed with the fact that they're engineers instead of treating it like what it is, just a career. Submitted by Emanresu on July 30, 2012 - 7:04am. For engineers, it's not just a career. It's part of our lives! Submitted by lexbarron on July 30, 2012 - 9:29pm. Submitted by Ronald Riehn on July 30, 2012 - 9:58pm. more like the whole damn thing sometimes. Submitted by meladamei on October 12, 2012 - 7:29am. Submitted by Ronald Riehn on July 30, 2012 - 8:15pm. Sadly, there were times when I wish it was like that for the Army... My two military jobs being Infantryman and Military Intelligence. "Oh so you're in the army? what do you do?" Infantry - Kill people and blow up their stuff. My answer - "Soldier stuff." That an actual Camelbak or one of the knockoffs? Submitted by BallardHill on July 30, 2012 - 9:02pm. I just tell 'em I'm paid to make and play with toys. Submitted by Amake on July 31, 2012 - 2:47am. Submitted by kriztov on July 31, 2012 - 11:09pm. Submitted by Rebekah on August 1, 2012 - 3:02pm. My cousin is completing an engineering degree at university this year and i was woundering if it will take over his whole like like the comments say? p.s. sorry if the grammar and spelling are out i'm dyslexic. Submitted by Toreus on August 2, 2012 - 12:00pm. More than likely, yes it will. Submitted by Fuseblower on August 3, 2012 - 4:11am. I think that Jam's right about what happens when you tell people - so the trick is not to answer the questions at all but deflect them, and let them discover things for themselves. It's also more fun! Submitted by Shadowydreamer on August 3, 2012 - 4:18pm. I must be doing something wrong.. someone says they're an engineer, I either say "Ooo.. of what?" with interest or "What's your specialty?" if its a bit more formal. Submitted by Fuseblower on August 4, 2012 - 3:32am. Well, there are always refreshing exceptions to the general rule, and you must be one! 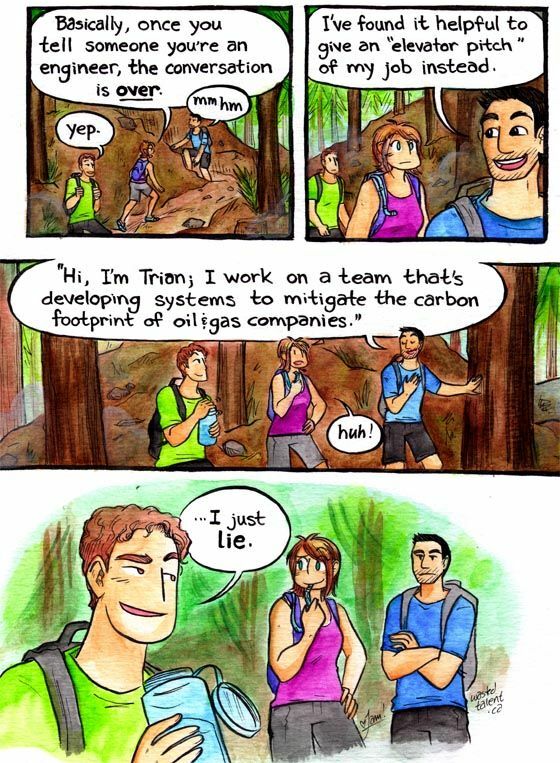 If a bunch of engineers are in the forest and nobody is around to hear them discussing strategies on how to hold a normal conversation, are they still huge nerds? Trian, I mangled your beautiful pitch, I'm sorry :( I didn't want to get too specific, obviously.